Volume 2 is the second installment in the compendium of all the Accessories for your Bernina Machine. 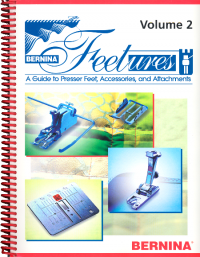 This Volume consists of 7 Units; Unit G has information on Patchwork Foot #37, Piping Foot #38, Walking Foot #50, Roller Foot #51 and Stitch Plates. Unit H has Information on Non-Stick Zigzag Foot #52, Non-Stick Straight Stitch Foot #53, Non-Stick Zipper Foot #54, Leather Roller Foot #55, Black Latch Bobbin Case and the Non-Stick Open Embroidery Foot #56. Unit I has information on 2mm Zigzag Hemmer Foot #61, 2mm Straight Stitch Hemmer Foot #62, 3mm Zigzag Hemmer Foot #63, 4mm Straight Stitch Hemmer Foot #64, 6mm Zigzag Hemmer Foot #66 , 2mm Roll & Shell Hemmer Foot #68 , 4mm Roll & Shell Hemmer Foot #69, 4mm Lap Seam Foot #70, 8mm Lap Seam Foot #71 and Adaptor Shanks #75 & #77. Unit J has information on Cut 'n' Sew #80 with Foot #90, Eyelet Attachment #82 with Foot #92, Circular Embroidery Attachment #83, Binder Attachment #84 with Foot #94, Bias Binder #85, Ruffler Attachment #86, Jersey Foot #91, Binder Foot #94 and the Zigzag Foot with Guard #99. Unit K has Information on the Reverse Pattern Foot #1C, Buttonhole Foot #3C, Automatic Buttonhole Foot #3C and the Edgestitch Foot #10C. Unit L has information on the Bulky Overlock/Braiding Foot #12C, Extra Wide Gathering Foot #16, Open Embroidery Foot #20C, Freehand Quilting Foot #29C, Sideways Motion Foot #40C, Rotary Foot #41 and the Non-Stick Zigzag Foot #52C. Unit M has information on the Standard Serger Presser Foot, Serger Multi-Purpose Foot & Guide, Serger Elasticator, Serger Cording Foot, Serger Blindstitch Foot, Serger Gathering Attachment, Serger Cover Stitch Foot and the Seam Guides & Deco Thread Guide. A definite "must-have" for anyone who wants to get the most out of their Bernina!